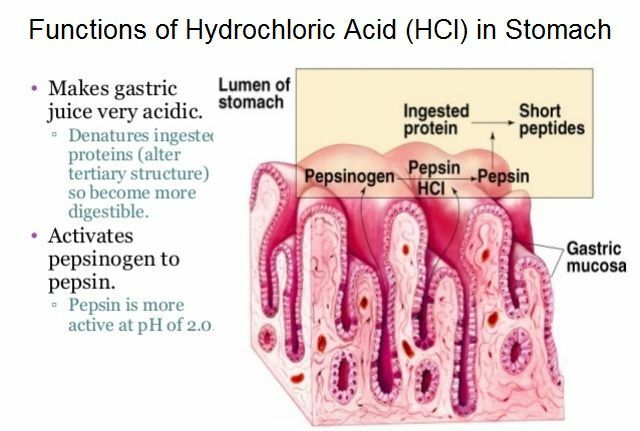 Hydrochloric acid is the main component of the gastric juices produced in the stomach and it maintains the stomach pH of 1 to 2 by acidifying the stomach contents. Hydrochloric acid acts as a barrier against foreign microorganisms and helps prevent infection. Presence of hydrochloric acid in gastric acid produced by the stomach prevents anemia, osteoporosis, nerve disorders, yeast infections, hair loss in women and many more illnesses. Too much acid in stomach is also harmful and leads to stomach ulcers.